Okay, Game of Thrones fans. Are you sitting down? You probably should so that we can let you feast upon some new GoT Season 8 imagery without risking your health and wellbeing. 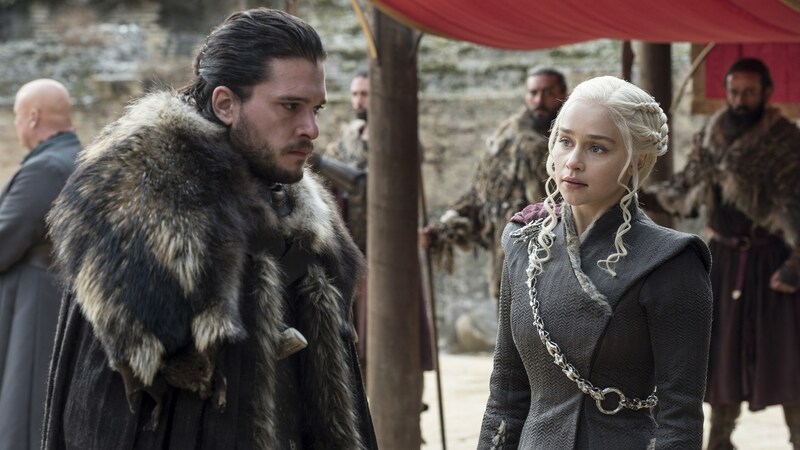 Just know that what we're about to show you is a photo from the set of Season 8, it involves actors Kit Harington and Emilia Clarke and, best of all, they're in full Jon Snow and Daenerys Targaryen attire, respectively. So, technically this is a still photo taken as part of Clarke's newly announced Omaze campaign for charity which would bring two fans to the set of GoT to get a full behind-the-scenes look at Season 8. But you know, we're going to take what we can get right now because we are so damn starved for GoT news that we need this right now. It's a balm. According to the GoT-devoted site Winter Is Coming, this still was part of a video Clarke shot for the Omaze campaign quite recently. The entire video is actually five minutes of pure hilarity, with the premise involving Clarke on the set attempting to get the Omaze crew into forbidden areas. Nothing goes quite as Clarke plans until Harington appears, dressed as Jon Snow, appearing to tell her to shut down the entire operations. This is really the first major glimpse we've gotten at anything pertaining to Season 8. Aside from the confirmation we still have to wait another dang year until the season premiere in 2019, we can just hold on to this until the next morsel of information comes through the pipeline. But even if it is just a small taste, you've gotta admit, it's pretty darn wonderful.